Deep Cleans To Eliminate Pet Odors and Remove Pet Dander While Naturally Moisturizing Pets Coat and Paws. Good For Between Baths Cleaning. 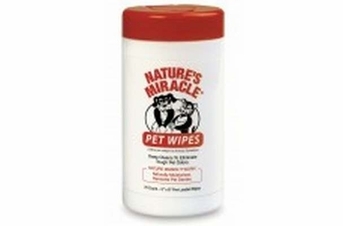 Eliminates Body Odor, Reducing Trips To The Groomer. Easy To Use Dispenser Pack For Quick Cleanings Or Taking When Traveling. Minimizes Hairballs Since Wipes Pick Up Loose Hair and Dander.